The entry period is over. Thanks to everyone who entered! Planning an adventure this summer? Capture your Anchor Adventure with an Anchor California Lager – now available in cans! 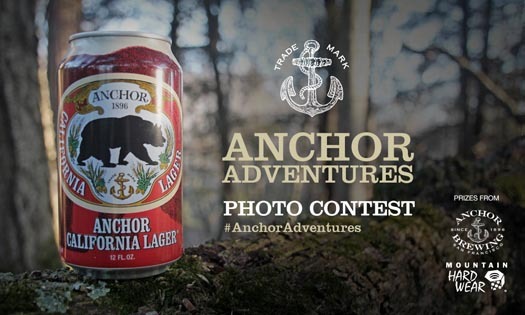 – or any Anchor brew, and enter it in our Anchor Adventures Photo Contest! Entries will be accepted through Thursday, August 21, 2014. Whether you’re at the beach, in the mountains, on a boat, or at a backyard barbecue, snap a photo of your Anchor brew and upload it via the Anchor Adventures Facebook app, or simply tag your photo with #AnchorAdventures on Instagram, Twitter, or Facebook to enter! Members of the Anchor Brewing Facebook community can vote for their favorite Anchor Adventures photos on the Anchor Brewing Facebook page each week beginning on Friday, June 27. Nine weekly winners will receive their choice of an Anchor California Lager Trucker Hat or T-Shirt, PLUS a Boxed Ball Cap from Mountain Hardwear! Each weekly winner will be eligible for the Anchor Adventures People’s Choice, selected by members of the Anchor Brewing Facebook community. Two additional Grand Prizes, the Brewer’s Choice Award and the Mountain Hardwear Adventure Award, will be selected from all entries by panels of judges at Anchor Brewing and Mountain Hardwear. 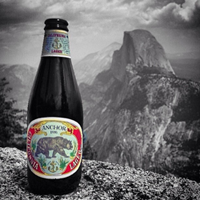 Grand Prize winners will receive an Anchor Brewing/Mountain Hardwear Adventure Package for your next Anchor Adventure! To celebrate the unique heritage of California’s State Parks and America’s National Parks, Anchor Brewing Company has partnered with the National Parks Conservation Association and the California State Parks Foundation to support their efforts to conserve and enrich the natural beauty and history of parks nationwide. Through two unique partnerships, a portion of proceeds from Anchor California Lager sales will help to support conservation projects in parks across the country. Since I was a kid, growing up here, in San Francisco, I always wanted to see the flamenco dancing at The Old Spaghetti Factory in North Beach. And when I was old enough to enter, there I was, right in front of live female, flamenco dancers accompanied by two guitarists. The small, elevated wooden stage held my attention as I gazed at the dancers right in front of me. Thrilling, exciting, hot & steamy were the shows I attended. And I got thirsty. And there was Anchor Steam, on tap. It was poured into these tall, old fashioned milkshake glasses. Yes, I was real thirsty. But the surprise which delighted my senses was the really dark liquid, also poured into those tall, milkshake glasses. And that was Anchor Porter. And it became my one, true love while watching all those flamenco dancers, with their castanets and the two flamenco guitarists, and they danced and played all atop that small elevated wooden stage, in the back room of the Old Spaghetti Factory. And I enjoyed another Anchor Porter. The earth never looked better. Just visited Lake Taho an Yosemite these are beautiful parks that need to be preserved .